Former Finn Harps captain Kevin McHugh produced a brilliant individual performance to help Kildrum Tigers to victory in Sunday’s Brian McCormick Sports Cup Final at Dry Arch Park, Bonagee. The veteran striker - playing at centre midfield for Kildrum - scored one, and also converted a penalty in the shoot-out as Kildrum came from behind to win on penalties. But it was McHugh’s overall performance over the 110 minutes that was so impressive. And he played a vital part in Kildrum’s revival after they fell 2-0 down by the 20th minute. Aidan Sweeney headed Kilmacrennan in front after three minutes, connecting with a brilliant John Sandilands delivery to direct the ball in over keeper Sean Friel. Daniel McLaughlin made it 2-0 with a wonderful finish, volleying home after latching on to Michael McLaughlin’s cross from the right. 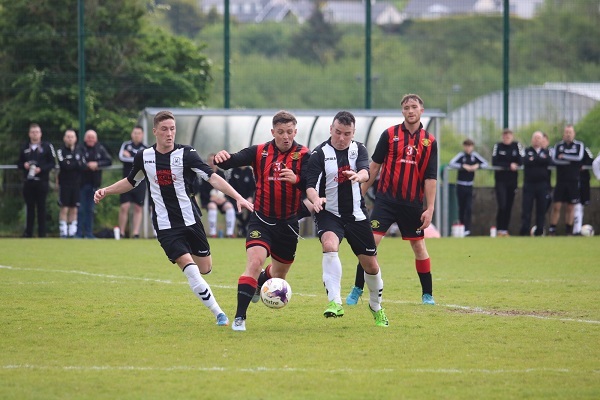 Kildrum - who sealed the Premier Division title seven days earlier - just couldn’t get into their stride and at half-time, they looked to have a mountain to climb. But they came out in the second half determined to find the goal that would take them back into the game. McHugh struck the crossbar with a brilliant free-kick just after the hour. However, not to be denied, the Kildrum No. 7 found himself standing over another free soon after, and this time he found the bottom corner with a perfectly flighted strike. Kilmacrennan dug deep and defended really well with Kieran Gorman and Gary Gorman really impressive in the centre of defence. However, after Kildrum had gone close to equalising on several occasions, Kilmacrennan eventually conceded again a minute into time added on when Johnny Carlin scrambled the ball home at the back post. Extra-time failed to find a winner - although both teams had men sent off following an ugly brawl which lasted several minutes. When calm was restored, Kieran Gorman (Kilmacrennan) and Michael Lynch (Kildrum) were shown red cards by referee, Joe McHugh. And so it was to penalties - and it was Kildrum who held their nerve to win out, their goalkeeper Sean Friel making two splendid stops to decide the final. KILDRUM TIGERS: Sean Friel, Gary Crossan, Brian Coll, Michael Lynch, Brett McGinty, Jonathan Carlin, Kevin McHugh, Damien Crossan, William Lynch, Oran Higgins, Gareth Colhoun. Subs: Daniel Clarke for Colhoun (h/t), Darren Dolan for Coll (67), Barry O’Donnell for G Crossan (80). KILMACRENNAN CELTIC: Jason Quinn, James Doherty, John Sandilands, Gary Gorman, Kieran Gorman, Aidan Sweeney, Michael McLaughlin, Ryan Shields, Timmy Burke, Liam McBride, Daniel McLaughlin. Subs: Mark Friel for Burke (49), Gerard McGranaghan for Friel (58), Caolan McDaid for McBride (73), Eamonn Martin for M McLaughlin (79), Paul McBride for A Sweeney (104). ASSISTANTS: Dessie McLaughlin, John Coyle.